By Michael Collins: Freddie Roach hasn’t been officially let go in his job as a trainer for former IBF/WBA light welterweight champion Amir Khan (26-3, 18 KO’s), but it’s expected that Khan will be making an announcement any day now about a new trainer to guide him through his next training camp for his upcoming December 15th fight date. According to Dan Rafael, Khan’s adviser Asif Vali and father Shah Khan asked Roach to dump his popular fighters Manny Pacquiao and Julio Cesar Chavez Jr. This was reportedly something that was needed in order for Khan to stay with Roach, as he wants more time with him and the other popular fighters sometimes get in the way. It obviously wasn’t a tough choice for Roach to pick Pacquiao and Chavez Jr. over Khan. Those guys are still winning, while Khan has lost his last two fights. It would be a huge mistake if Roach dumped Pacquiao and Chavez Jr. just so that he could spend more time with Khan, who might be on the verge of seeing his career sink even further if he suffers another knockout loss in the next year. How Khan and his promoters at Golden Boy can be kept away from punchers in the light welterweight division is the big question. Most of the top fighters in that weight class are excellent punchers and it seems almost impossible to figure out a way for Khan to be guided past all those guys without being criticized for dodging the best guys. 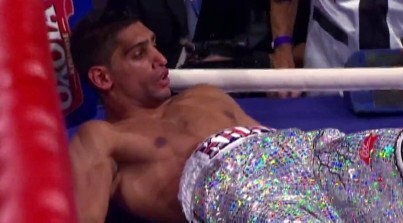 Khan would have to avoid the following fighters if he was to be kept away from punchers: Lucas Matthysse, Danny Garcia, and Mike Alvarado. Khan could fight guys like Lamont Peterson and Juan Manuel Marquez, but even they would be dangerous for him. Khan basically ran, shoved and held Peterson in losing to him by a 12 round decision last December.